We missed the release last week of an album from a key member of Canada's most-awarded roots bands ever, The Rankin Family. Jimmy Rankin’s new Moving East (out September 28, True North Records) is a homecoming album featuring true stories, tall tales and bittersweet ballads, and the classic folk-rock sound that Rankin helped pioneer in his native Cape Breton home. Just at a time when people are searching out authentic cultural voices, strong stories and well-crafted songs, Rankin has made an unapologetically folk-rock record, with a raw, unsentimental and current edge. “I’m putting the party back in the kitchen” quips Rankin. It’s called Moving East because that’s exactly what Jimmy’s done. He’s moved back home to Nova Scotia after seven years living and working in Nashville. Hooking up with fellow Nova Scotian Joel Plaskett as producer, he’s made an album with songs running the gamut from gritty pub tunes to soulful ballads all featuring great storytelling, and fine songwriting. 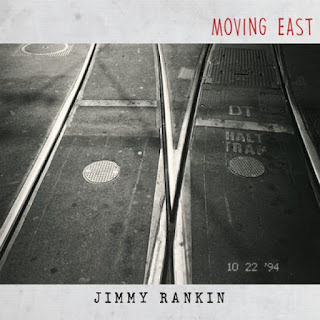 One of the most famed Canadian songwriters, Jimmy Rankin wrote such classic Rankin hits as “North Country,” “You Feel The Same Way Too,” and the Juno winning single “Fare The Well Love,” voted the #1 East Coast song of all time by CBC listeners across Canada. His own hits include “Followed Her Around,” “Morning Bound Train,” and “Cool Car.” Jimmy’s the guy who wrote “Mull River Shuffle” a Cape Breton anthem with an all-ages cult following, jamming dance floors and mosh pits at parties, weddings and raves as the last big song of the night. Says Rankin “With Moving East, I was trying to distil the fabric of Maritime culture into a musical collection replete with life’s highs and lows, and breathe life into stories that capture a feeling, a moment in time, live off the floor and organic.” It’s an album full of classic Cape Breton storytelling, unashamedly celebrating his moving back, and making the music he loves.